During the most anticipated and bet on boxing match of all times, Floyd Mayweather not only helped his own image as boxing champ, but also gave the Las Vegas sportsbooks a boost in profits. As Mayweather got a unanimous decision against Manny Pacquiao, with his 2:1 odds as favorite, most people bet on the underdog. With examples like the William Hill US sportsbooks in Vegas had 75% of their bets being placed on Pacquiao. 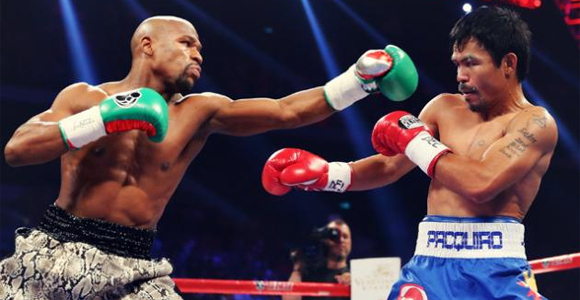 The fight got at least $50 million in wagers, making it twice as much as the next highest bet on boxing event. There were many different bets placed, not only on the straight up winner. One of the major bets that was placed was on prop bets, ranging from the number of rounds the fight would last, where 84% wagered that the fight would last all 12 rounds. The bet that accounted for a whopping 74% of total money wagered was whether Mayweather would win by a decision. Some bets were mild in the hundreds, while other more excessive bets were in the hundred thousand range. Most fans were disappointed with how the match played out, with Mayweather using his usual stand-offish style, letting his opponent get tired and moving in for body blows and hard hits. It was indeed, a boring fight. The most excited for this outcome were obviously the people that placed big bets on Mayweather to win. Hopefully we will get another huge match and rivalry as the Mayweather-Pacquiao one, as boxing dwindles and the UFC gains even more popularity; although, the UFC has still to get this much attention, and not to mention, wagers.